Yep. You aren't seeing things. That is Marcin Gortat driving an armored hum-vee. 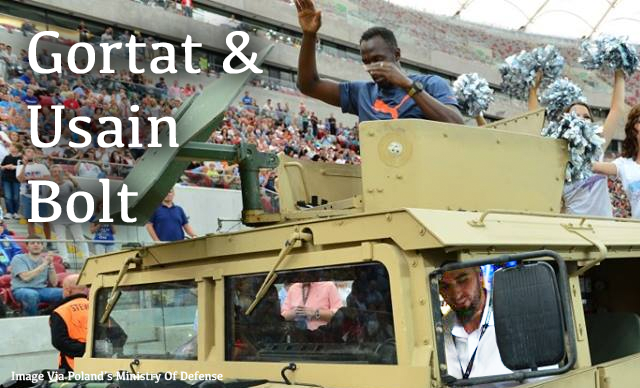 And yes, the guy in the gunner's seat on top of the jeep is world record holding sprinter and probably fastest man in the world Usain Bolt. What in the heck is going on! Usain Bolt was in Gorat's homeland of Poland, in Warsaw to run some kind of race. After the dramatic entrance with the Washington Wizards center (who appears to be the most popular/famous person in the entire country of Poland), Bolt ended up setting the world record for the 100 meter dash.